Heat oven to 350°F. In small bowl, mix brown sugar, margarine and cinnamon until crumbly; set aside. Slice squash into 1/2-inch rings. Cut rings in half; remove seeds. Cut apple into chunks. In shallow dish, stir together Bisquick® mix, seasoned salt, pepper and cracker crumbs. In another shallow dish, mix egg and water. Dip pork into egg mixture, then coat with Bisquick mixture. Spray 12-inch nonstick skillet with cooking spray; heat over medium-high heat. Cook pork in skillet 6 to 8 minutes, turning once, until coating is brown. Place pork in ungreased 13x9-inch (3-quart) glass baking dish. 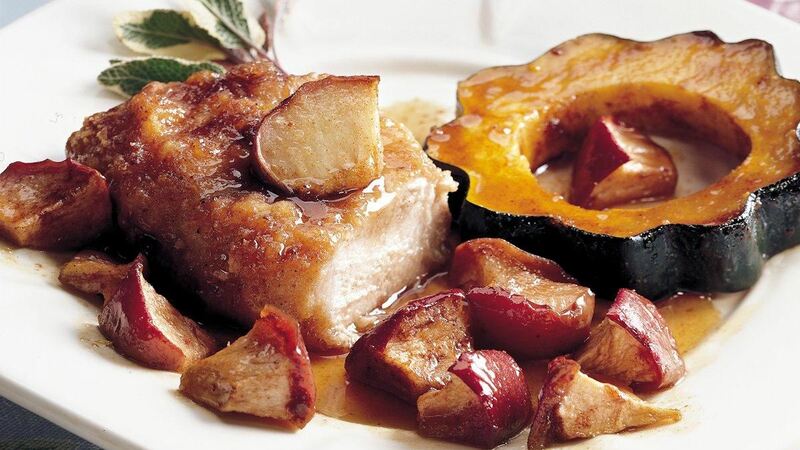 Arrange squash and apples around pork. Sprinkle with brown sugar mixture. Bake uncovered 40 to 45 minutes or until squash is tender and pork is no longer pink in center. No seasoned salt? Use 1/2 teaspoon regular salt instead. Special Touch : Add a festive look by spooning whole berry cranberry sauce over the squash immediately after removing the dish from the oven. The heat of the pork, apples and squash will warm the sauce.